My IKEA bookcase (model 'Vallvik') used to stand tall and straight in the entrance hall of my small Manchester apartment. When I walked through the door after a day’s work I would be greeted by six shelves of heavy duty art books that I had accumulated throughout my curatorial career. Working at Tate Britain we were given three free catalogues each year and, by making sure that all the books I took out of the Tate Library were returned on time, the librarian treated me with a certain amount of favouritism and gave me first pick of any duplicates which were sent to the Gallery. I soon amassed a huge collection of monographs and exhibition catalogues – characteristically of art books they had heavy-duty paper with spines a good two inches thick. I arranged them in the bookcase by artist and then by exhibition catalogue and, when I was feeling very methodical, by art movement. Gradually the shelves swelled with books and the ornaments I had arranged on the middle shelf were moved into a box so that more books could take their place. 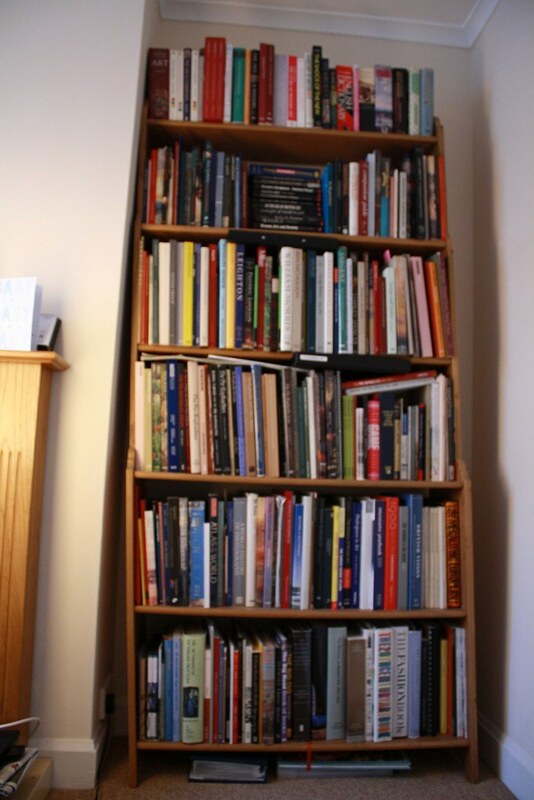 The IKEA bookcase is particularly good for its tall shelves – art books tend to tower over every other genre. In this age of austerity when everything from chocolate bars to tins of sweetcorn are getting smaller art books continue to get bigger and bigger, and no exhibition is complete without a doorstop of a fully illustrated book. Now installed in my Cambridge house the bookshelf can no longer cope with the heavyweight glossy paper so desired by publishers of art and auction catalogues and, as the photo shows, it impressively leans to one side. Attempting to move it back to the centre the bookcase creaks as if in tremendous distress. I’ve also given up a bit on my ordering and numerous books are out of order – reference books rub shoulders with catalogues published by the giants of the art publishing world, Taschen and Thames & Hudson. Yet I feel confident that the bookcase will continue to support my library until we move house again. In the meantime I will exercise a certain amount of caution and listen out for any signals of anguish from the wooden shelves. Looks rather nice for an IKEA bookcase. Thin, but nice color, and seems of older design (not just straight).